This is one of my treasures that I received for Christmas. Her name is Rosalinda. She plays music. My daughter said the song she plays is very stereotypical, but that’s ok. La Cucaracha is a very familiar song to a lot of us and the song became popular during the Mexican Revolution, so it has relevance. 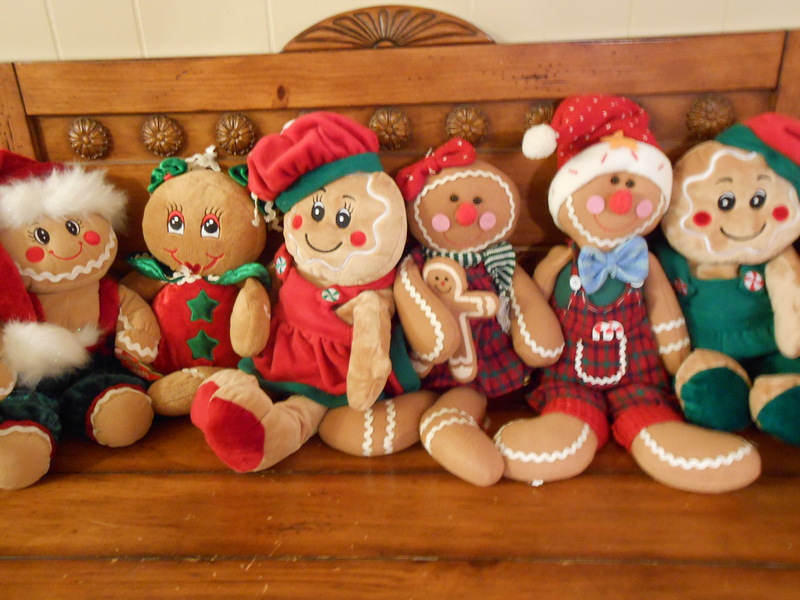 These guys are ready to go back into hibernation till next year. My garden looks very sad. The frost did a good job of damaging my plants. 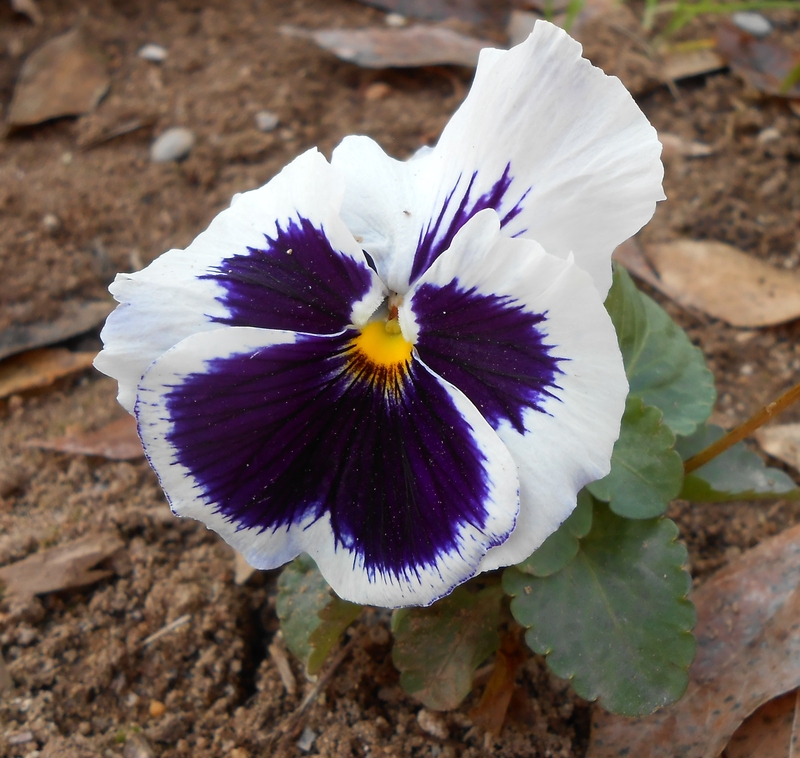 The only ones left standing are my pansies. 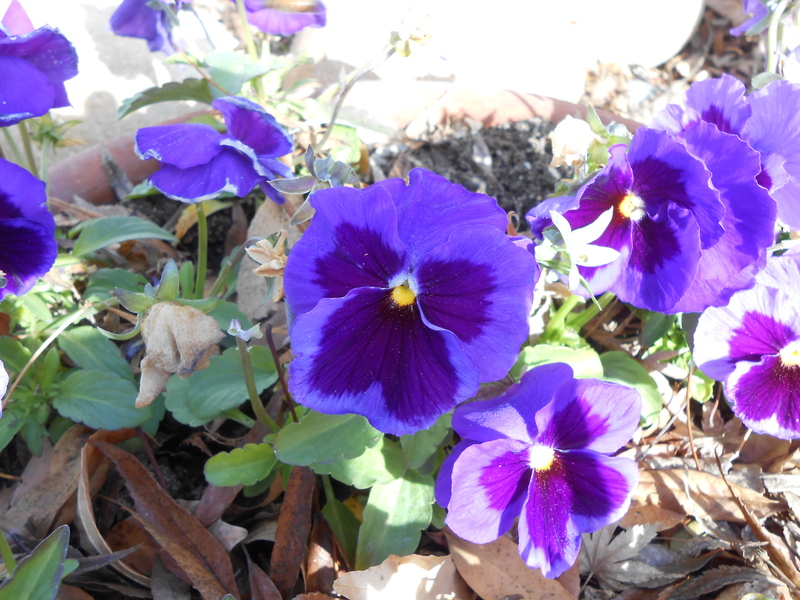 They’re bright and cheerful, which gives me hope. 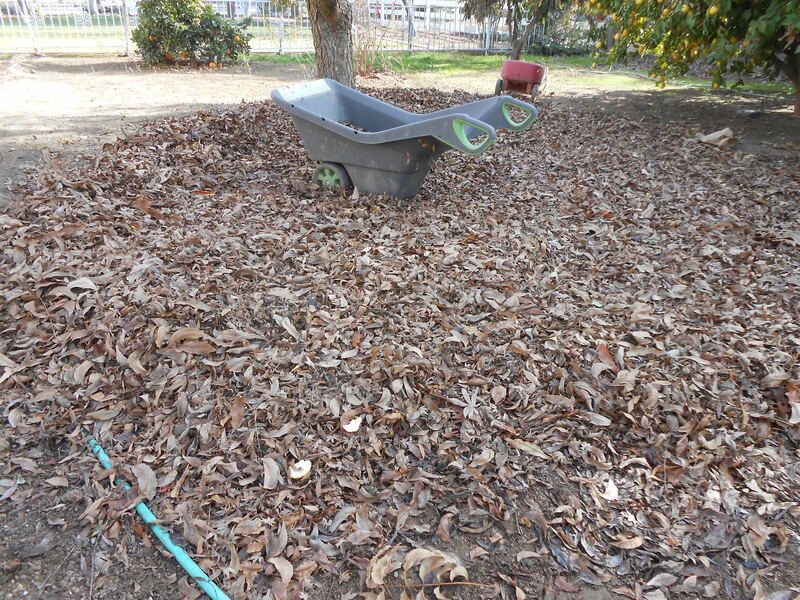 And then, there are all the leaves that need to be raked, but we’ll save them for another day. So much to do, I don’t know where to begin. 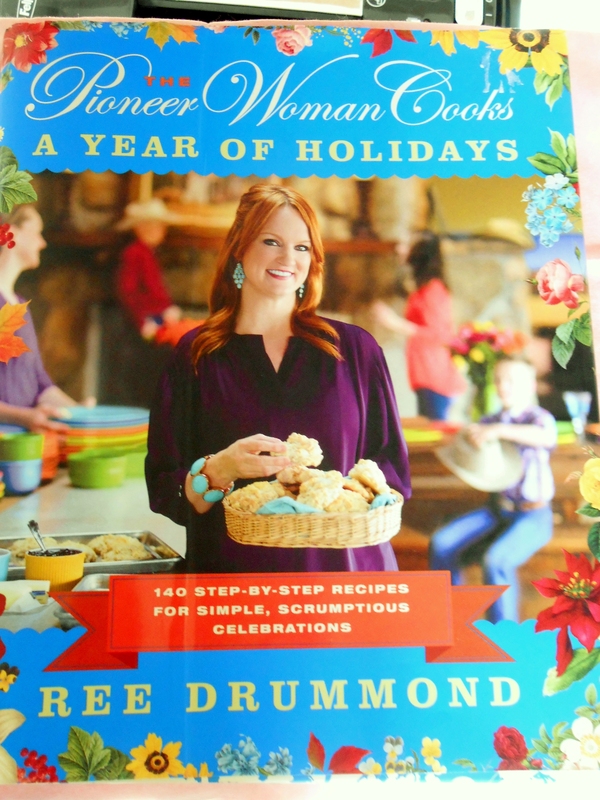 Two of my favorite blogs are Pioneer Woman and Susan Branch. 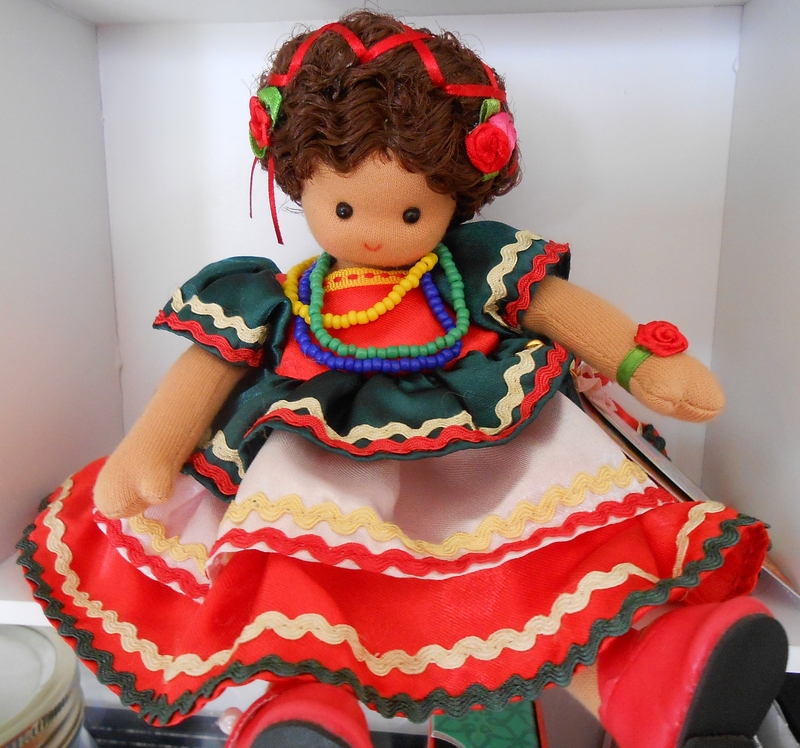 In fact I am a Mexican wanna be Pioneer Woman, so I guess I would go by the name of La Ranchera. In any case, I really would have some really big shoes to fill. I recently bought books that both ladies have written. 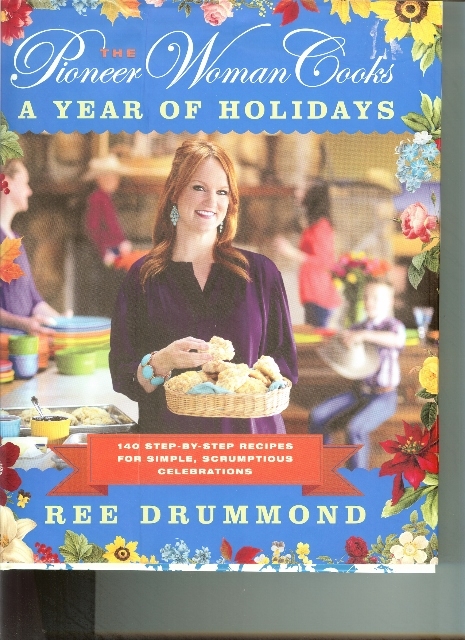 Pioneer Woman Cooks A Year of Holidays is a very helpful book full of easy recipes and easy instructions that also have step by step pictures of the whole process, which is great for those of us that are “show me how to do it” kind of person. Also, Ree Drummond is not afraid to use a bottle of this, or a can of that, to make something a little easier. One recipe I want to make on Christmas morning is baked French toast. Just saying that, makes my mouth water. Another recipe of hers that I love to make, is the steak bites for breakfast, which are very tasty. This recipe is not in her new book, but if you look it up on her site, you can find it. It’s also very simple to make and it adds variety to your breakfast table. 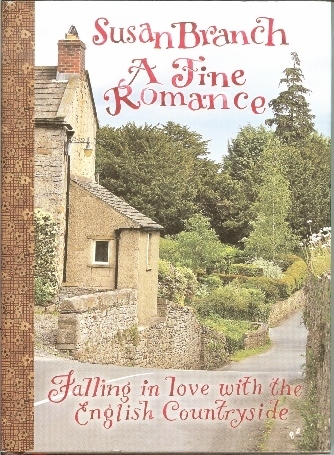 A Fine Romance by Susan Branch was somewhat of a disappointment at first glance. On her blog her pictures are always so crisp and bright that they make you feel like you’re actually visiting with her. So as I looked through her book, I wasn’t getting the same feeling. Maybe I was expecting a different look and she wanted her own special look, quaint is all I can think of. Since I haven’t had time to read it I can’t say to much except, Susan Branch is such a talented lady that she certainly doesn’t have to worry about my opinion. But I can’t wait for some quiet time to read it. 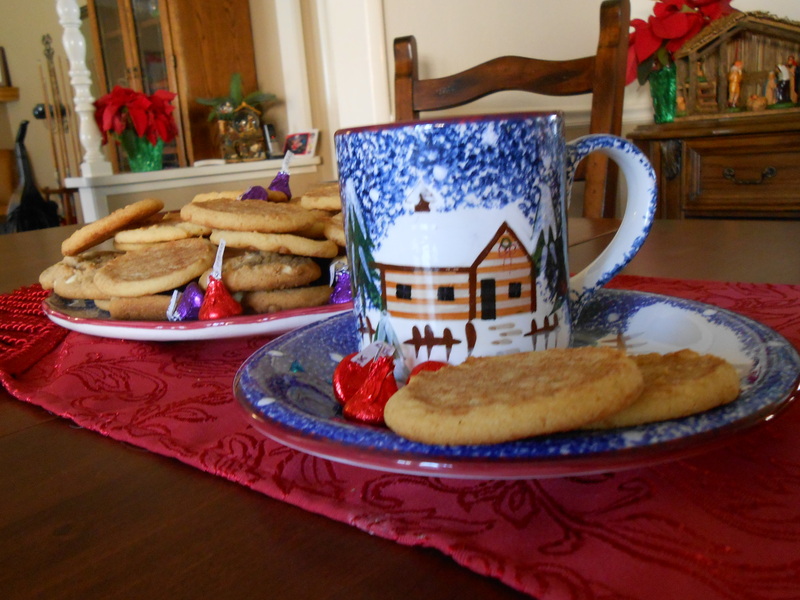 With all the rush and stress of roaming through the malls, and baking, wrapping, and decorating, it’s time to treat ourselves to a few minutes of solitude and goodies. The Village is waking up. 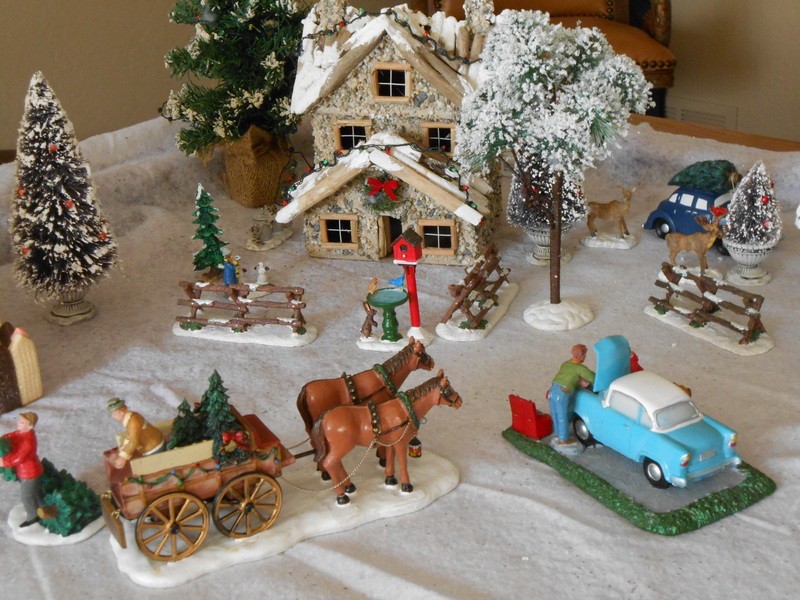 Our grandkids love our Christmas village. 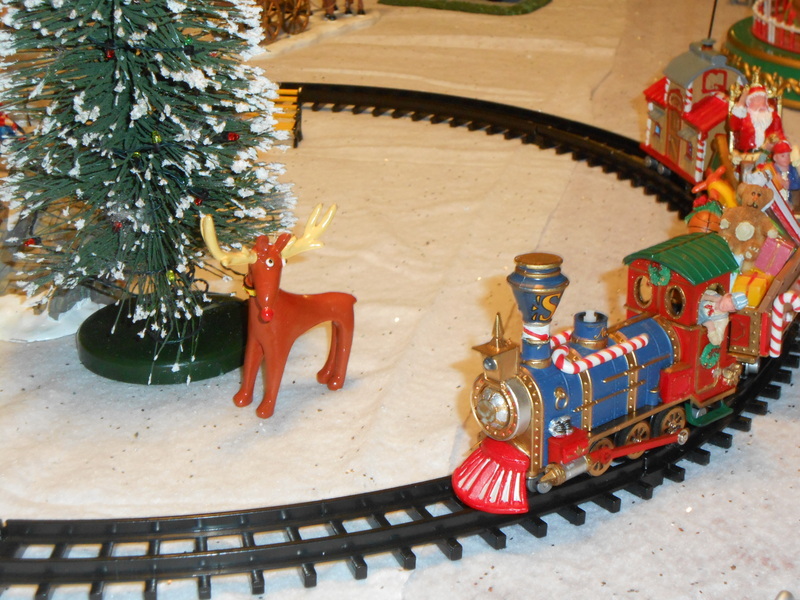 They always get excited, especially our youngest grandchild, because of the little train we put in the middle of the village. 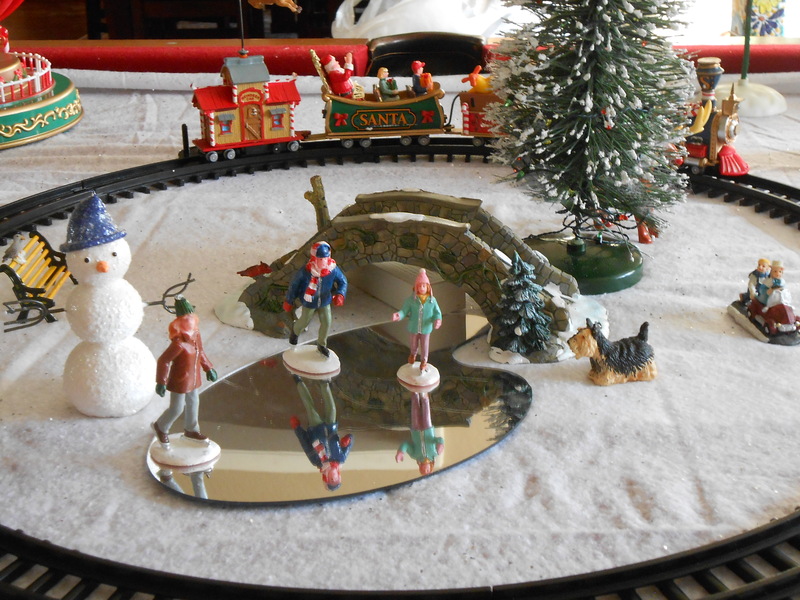 Our pool table is the foundation for the little town that is put together with different pieces that we have collected. The ice skating rink is busy with skaters. I love this wonky reindeer! 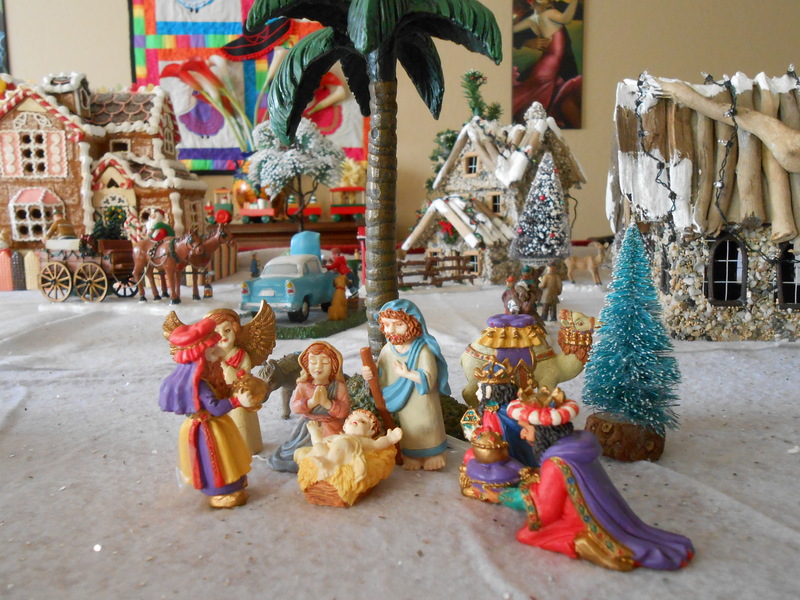 And of course, the nativity scene is an important part of the whole village, for me. And guess who flew in? 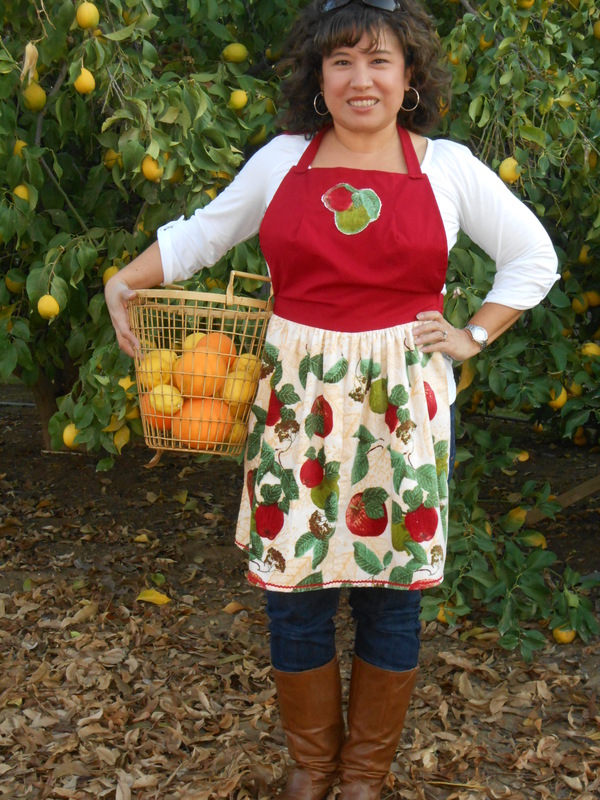 Dishes, aprons, oranges and lemons. 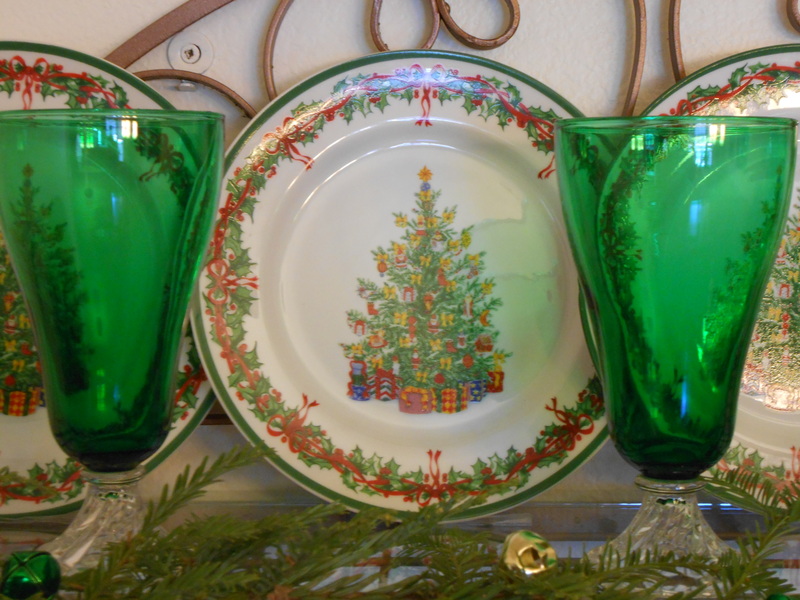 A few years ago I decided to start buying the Target Christmas dinnerware; little did I know that they were going to discontinue the pattern. So all that I was able to get was 4 salad plates and 4 saucers, not even 1 cup could I find at any of the Target stores. Each year I procrastinated about purchasing the pieces until it was too late. My husband always scolds me when I say, “Oh, I’ll get it later.”, because later becomes never. How many of you have done that? 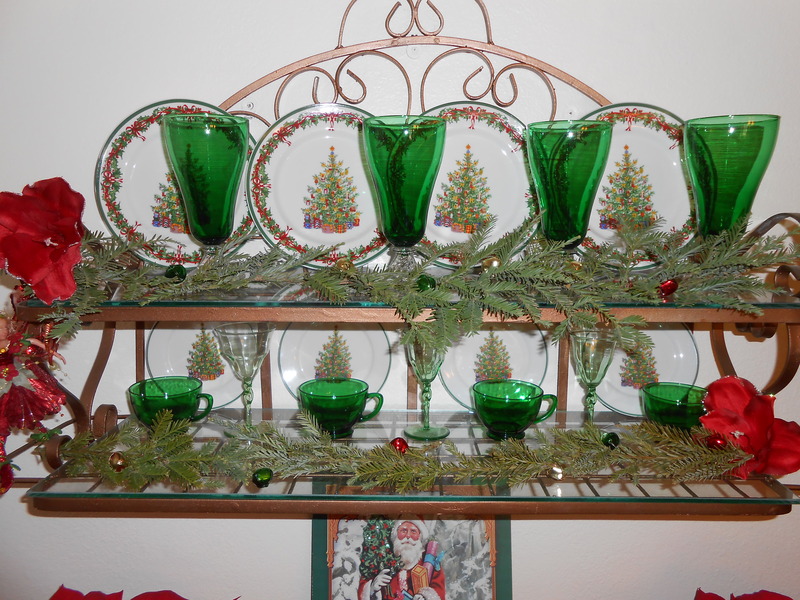 Well now I have to put them together with my depression glass, which looks ok, but I can’t really use them at Christmas time because there won’t be enough for the 12 of us. Another lesson learned! 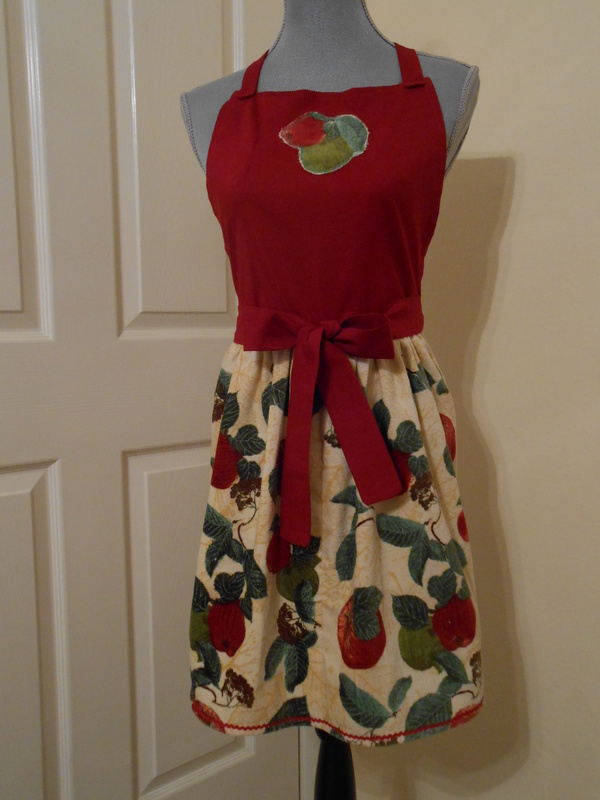 I posted about an apron a while back made with kitchen towels and I’m happy to say I finished sewing it. I promised myself that I would wear aprons in the kitchen from now on because I have ruined many of my tops with grease stains. One of my lovely daughters agreed to model the apron. She looks ready to do my chores. 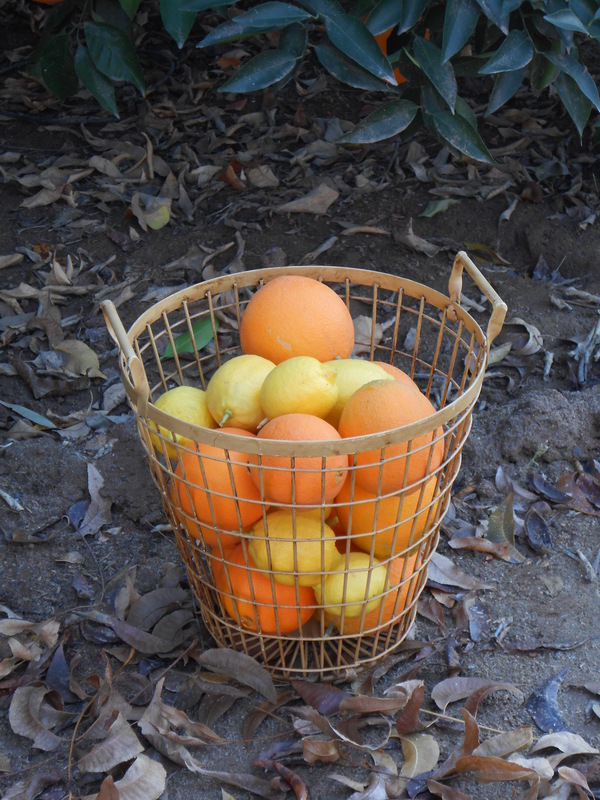 I had just picked some oranges and lemons, that have been out in this frosty weather, that we’ve had for 5 days. So hopefully they’re still good enough to enjoy. Frosty nights and more decorating. We dressed up our bare lamp-post. Now it welcomes friends and family! 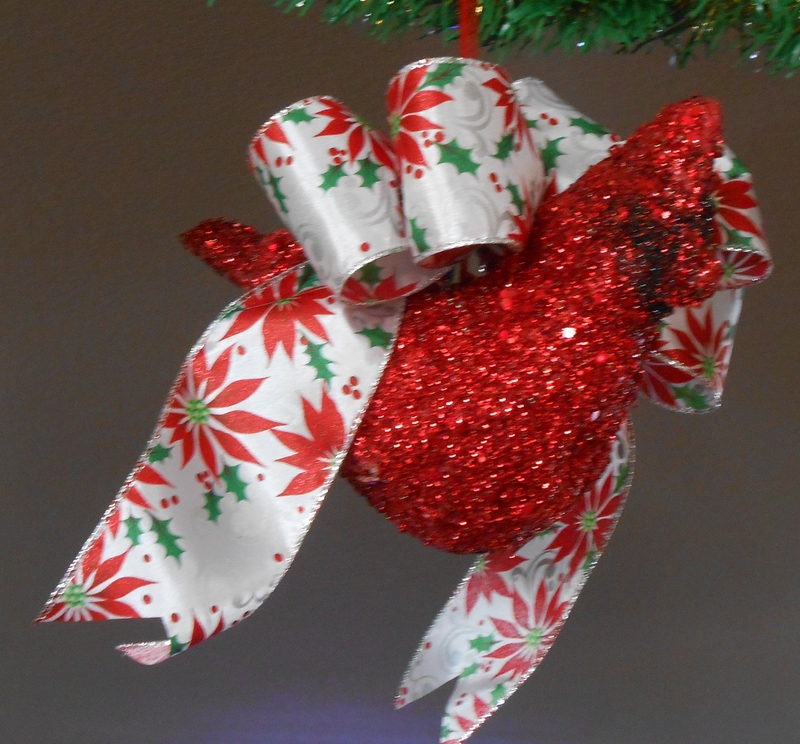 I’m still using my 5 inch ribbon since the roll had 25 yards on it. Then I moved on to a shelf I have in the hallway. 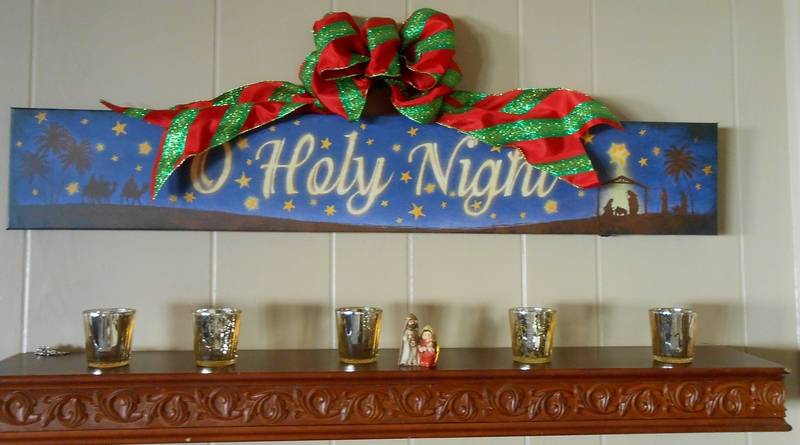 I love this sign because it lights up and the little stars start to twinkle. 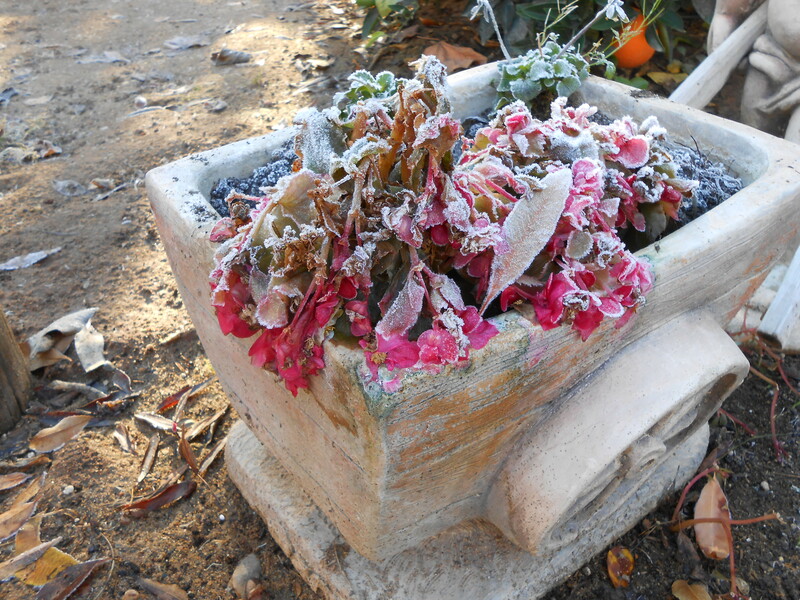 We’ve had some hard frost here in the central valley of California and it’s feeling more like winter. 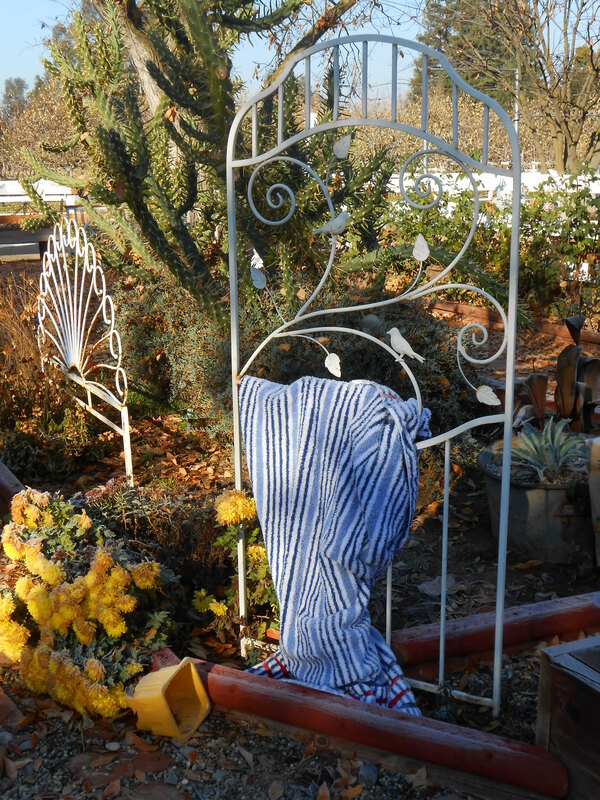 Many of my plants were zapped by the frost and because I didn’t have time to purchase the correct protective covering for the plants, I used what I had handy. 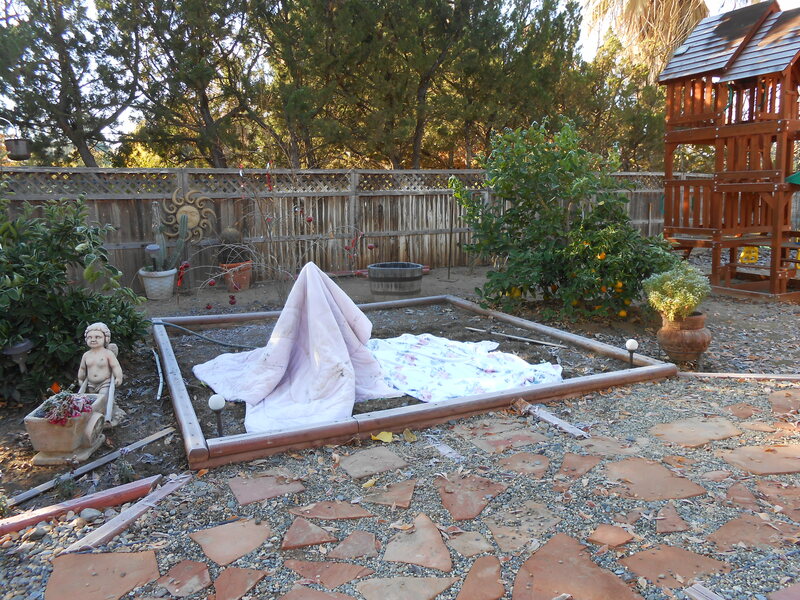 My bougainvillea is hiding behind the towel and the snap peas are under the blanket. My poor begonias were frozen. I do want to thank WordPress for letting us have snow on our page. I love it! I’m thinking if they can give us falling leaves for autumn and flowers for spring, that would be fun. Yay, I finished! Oops, no I didn’t! 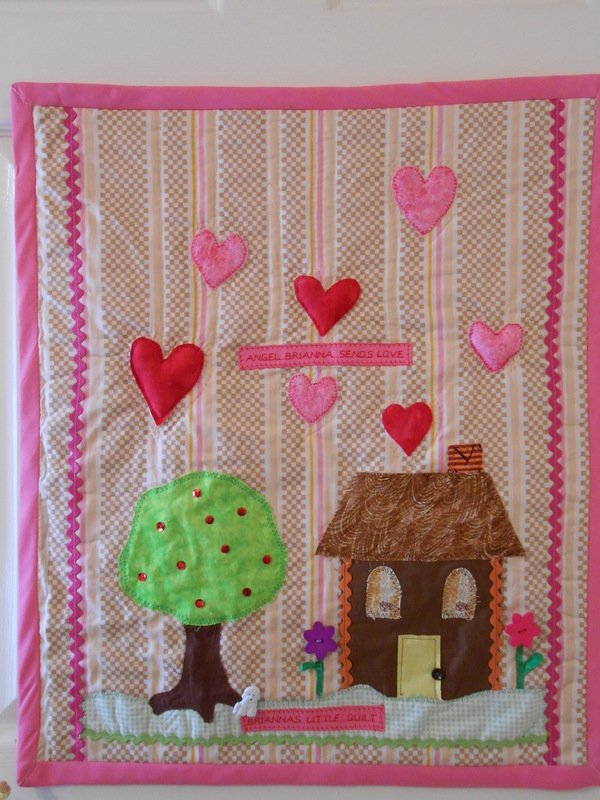 I have been working on the “in memory of” wall hanging for my niece for about a month. Well, last Wednesday I finally finished it. 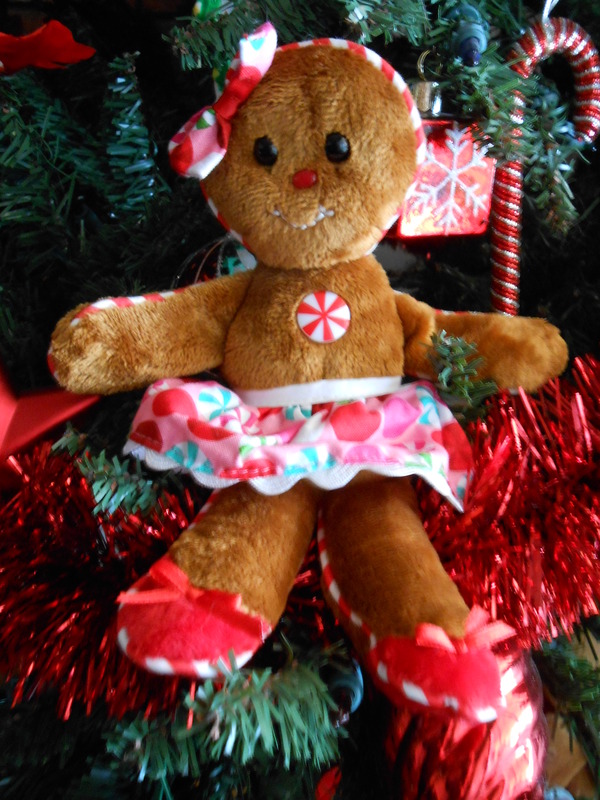 I was so proud of myself, because I had said that I would have it ready for her in November. 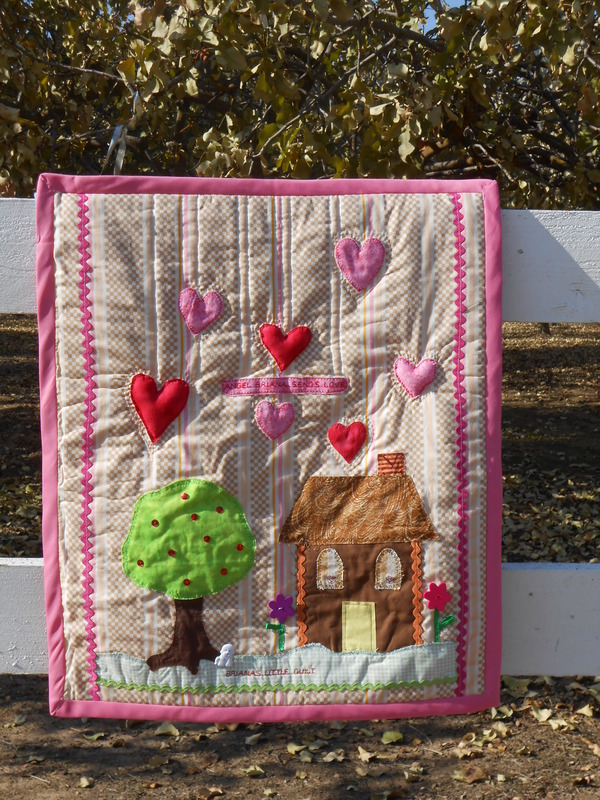 Everyday I would look at the little wall hanging to see if I was still pleased with how it was turning out. So, as I was looking it over last Wednesday, after I had finished it, I groaned and almost cried after noticing I had misspelled the baby’s name. I could not believe my ignorance! How could I have done this? 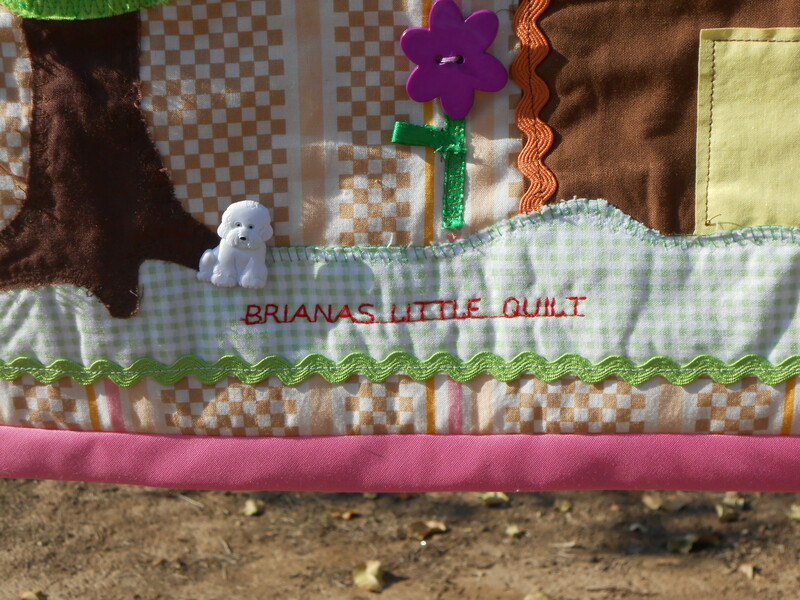 Even after I double checked on the spelling several times, it still didn’t penetrate my brain when I machine embroidered the name on the quilt. Ugh, now to try to fix it some way. I just want to scream, yell, and cry over my big blunder! Yes, I spelled Briana with one n and it should read Brianna, with a double n.
So this is how I fixed my mistake. I embroidered the name on a piece of binding and tacked it over the original. Yes, now I am finished and happy!